A couple of weekends ago, we went to Rochester Christmas Market. We chose that particular weekend, as it was also the Dickensian Christmas Weekend. Charles Dickens lived locally in Higham and many of his novels were inspired by the surrounding area. 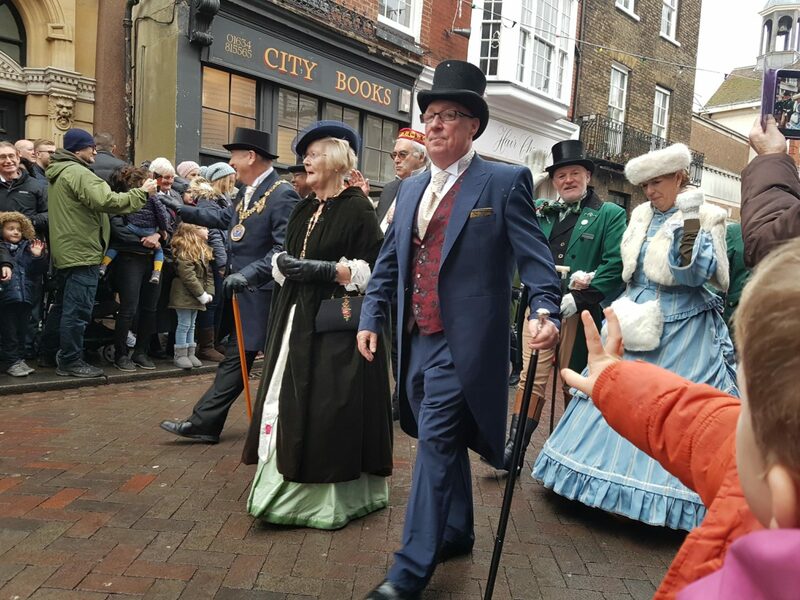 This is one of two festivals in Rochester throughout the year in which Dickens enthusiasts, re-enactors and many others gather and celebrate Charles Dickens with members of the public. We arrived just in time for one of the first parades of the day. It’s always such a delight to see so many beautiful outfits and smiley faces. It’s great fun and feels very festive! This historic parade has been going on for decades. 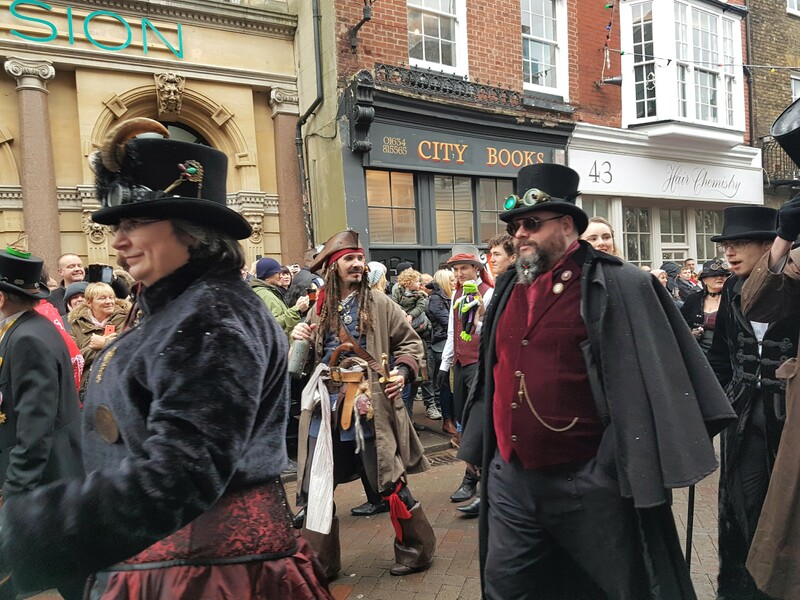 However, in recent years, a steampunk society have also joined the parade. 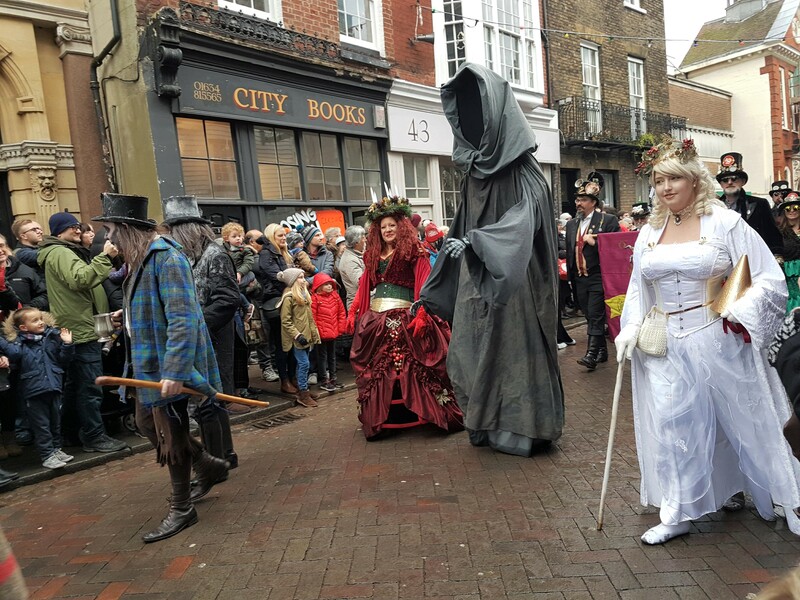 The ghosts of Christmas past, present and future took part in the parade. If you’re unfamiliar, these are characters from Charles Dickens’ A Christmas Carol. Several members of the parade are always dressed as characters from Dickens novels, a firm favourite being Fagin! I have to been so many of these parades now, that I often recognise people taking part in them. Indeed, many of them have been attending for decades! The mayor and mayoress took part, also looking very smart. Once we’d watched the parade, we went up to the market to do a little Christmas shopping. There are a variety of stalls selling things including cheese, ornaments and jewellery. However, my favourite part is probably the crafts marquee. I love the glass ornaments, handpainted vases, knitwear and other handmade things that can be found there each year. 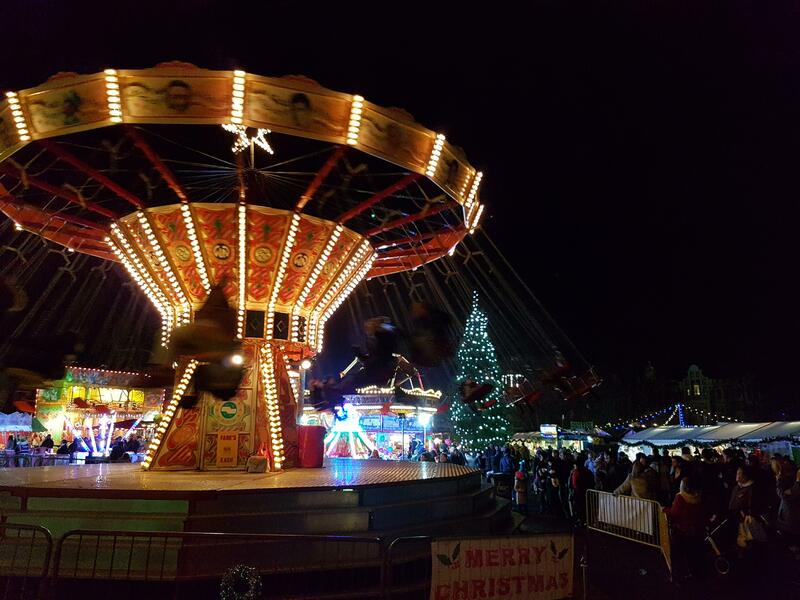 As darkness fell upon us, the funfair looked even more brilliant than it did in the day time! 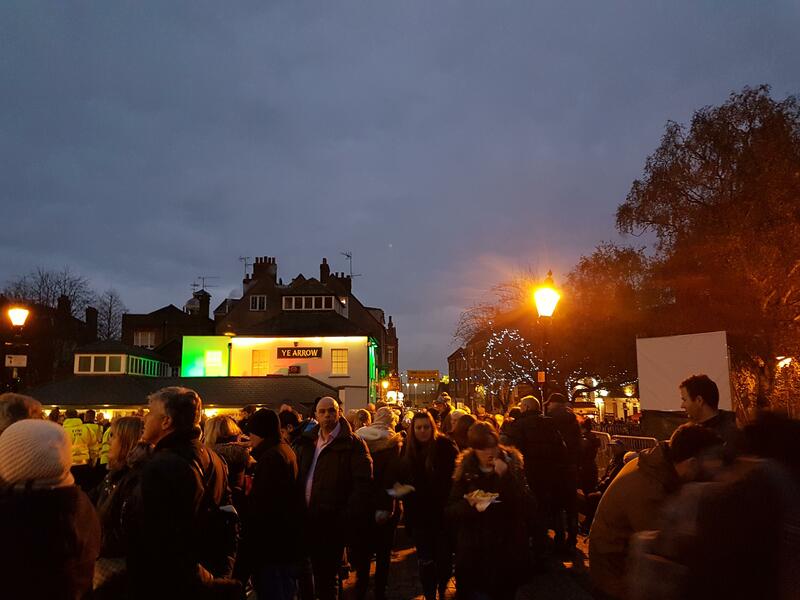 There was a candlelit parade along the High Street before the carol service started outside the cathedral. However, I decided to get a good spot for carol singing. Dave dashed off to get us some food from the German Sausage stand in the castle grounds in the meantime! We had a great spot and there was a wonderful atmosphere in the crowd. This was helped by the Canon’s cheesy Christmas jokes, of course! She slept through some of it, but when she woke up, Autumn really seemed to enjoy the singing! With the snow machine next to us, we were covered in fake snow and felt very festive afterwards. 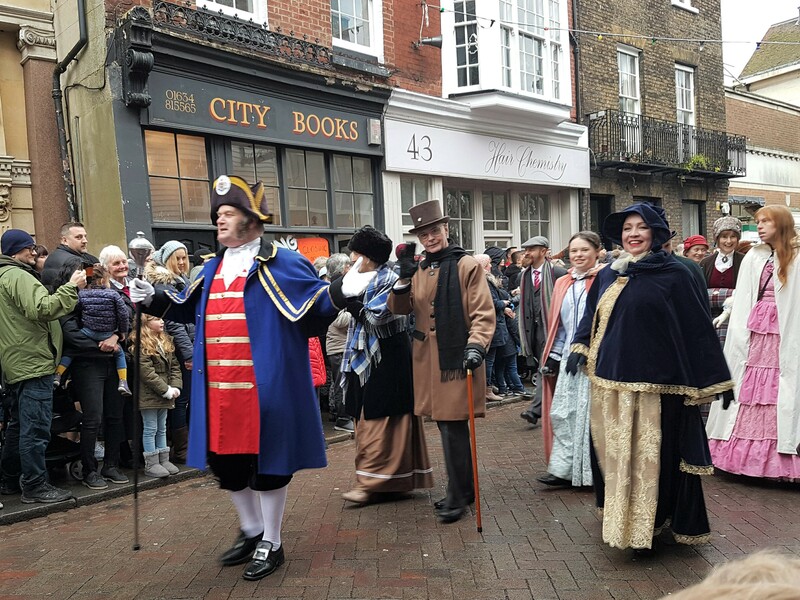 Have you ever visited Rochester Christmas market, or the Dickensian Christmas weekend? I’d love to hear from you!